With sunflower, flax, pumpkin & hemp seeds. Source of omega-3 fatty acids. Ireland's No. 1 porridge oats.A delicious, creamy Multi Seed Porridge We have combined our Irish porridge oats with Sunflower, Flax, Pumpkin and Hemp seeds to provide an additional nutritious boost to your breakfast. The result is a warm, nourishing bowl of Flahavan's Multi Seed Porridge with a deliciously creamy taste and crunchy texture that we hope you will enjoy. An extra healthy breakfast We believe that a great day starts with the shared goodness of porridge oats. Our oats are a delicious source of wholegrain, protein and fibre, as well as being low in sugar, salt and saturated fat. With the addition of seeds, Flahavan's Multi Seed Porridge is also a source of Omega 3 fatty acids and Thiamin. John Flahavan Each 40g serving of Flahavan's Multi Seed Porridge contains 0.6g alpha linolenic acid and a third of the 3g of beta-glucan suggested per day to help maintain normal cholesterol levels. Beta-glucan is a soluble fibre found in oats and some other foods. Regular consumption of beta-glucan as part of a varied, balanced diet and healthy lifestyle can contribute to the maintenance of normal blood cholesterol levels. (Serves 1)Stir 1/2 cup (40g) of Flahavan's Multi Seed Porridge Oats with one cup (220ml) of cold water/milk in a deep bowl allowing over an inch at the top of the bowl for the oats to cook. Microwave on high for 2 1/2 to 3 minutes, stir and serve. This is based on a 900W microwave. Cooking times will vary according to wattage. As with any hot product please be careful. 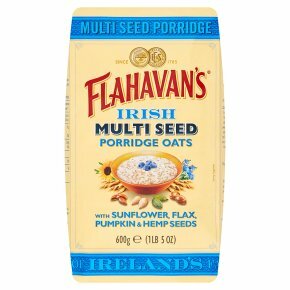 (Serves 2)Stir one cup (80g) of Flahavan's Multi Seeds Porridge Oats into 2 1/2 cups (550ml) of cold water/milk. Bring to the boil and simmer for 3 minutes stirring continuously.